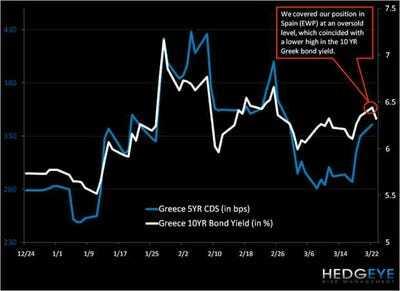 One of Hedgeye’s analysts, Matthew Hedrick, today points out the ongoing problems associated with the hot topic of the month: Greece. 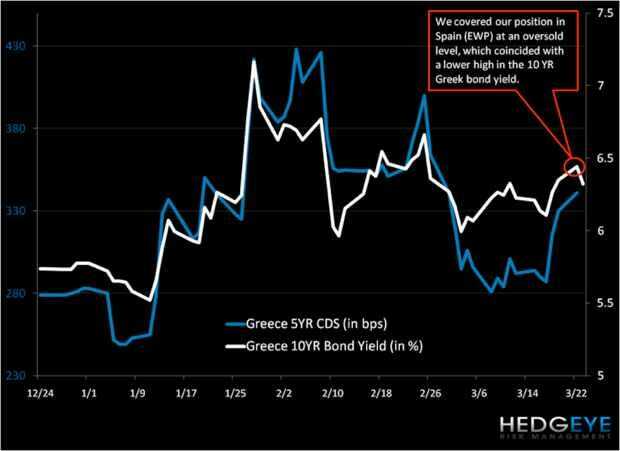 Hedgeye: Ahead of European leaders meeting in Brussels this Thursday and Friday for an EU Summit, the media frenzy continues to beg for guidance on how Europe and/or the international community will respond to Greece’s sovereign debt issues. However, if German Chancellor Angela Merkel has her way—and she recently said there’s no need for EU leaders to make any “concrete decisions” on Greek aid at the Summit—we’d expect to see continued volatility in markets deemed to have sovereign debt l issues, and carry-over weakness in the EUR versus the USD. The second chart below of Greece’s 10YR bond yield and Greek 5YR CDS prices demonstrates that heightened fears surrounding Greece (and the PIIGS) persist, even post PM Papandreou’s global road show to garner economic support earlier in the month. You’ll note that we covered our tactical short position in Spain (via the etf EWP) at an oversold level on 3/22, which coincided with a lower high in Greece’s 10YR yield.